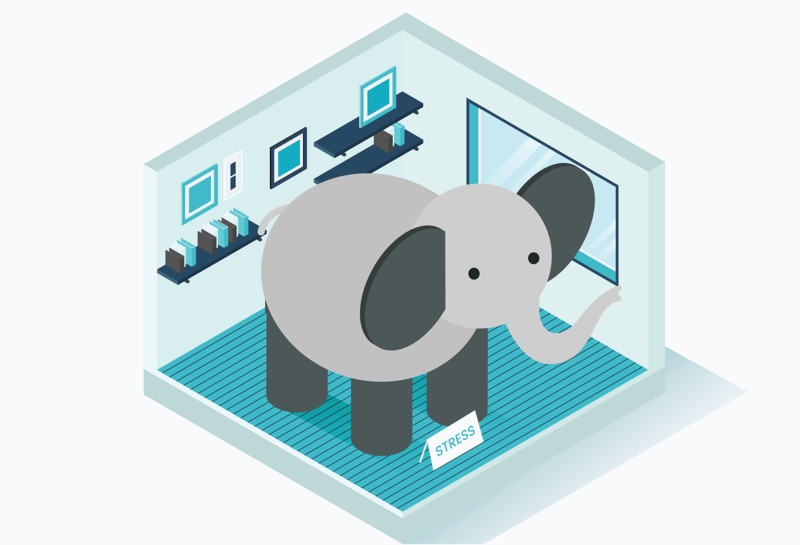 There’s an elephant in the sales room, and nobody wants to talk about him. Sure, everyone on the team knows he’s there. They can all see him. He even treads on people’s toes from time to time. But hey, that big old elephant just keeps on getting ignored. He’s there, snuffling by your desk when you hang up after another unsuccessful sales call. He’s there, looking over your shoulder when you tear a page from the calendar and realise that you’ve just missed another sales target. And sometimes – but it’s getting more frequent lately – he even follows you home, watching silently from the corner of the bedroom, as you struggle with sleep, for the umpteenth night in a row. The elephant even has a name, and his name is Stress. Why is selling so stressful? It makes you wonder why anyone would work in sales in the first place. The numerous causes of stress in sales can affect both your mental and physical health. It’s been medically proven that stress can raise your blood pressure, cause heart attacks and strokes, destroy personal relationships, play havoc with sleeping patterns, lead to substance abuse, and may even be the primary cause of numerous suicides. Workplace stress can become a vicious circle. For example, you miss a sales target and become stressed, in turn, that stress causes you to lose focus and miss the next target. Before you know it, that circle of stress has gotten bigger and bigger and eventually blocks out even the tiniest glimpse of sunlight. Not pleasant reading I’m sure you’ll agree. Firstly, I’m not a doctor. (I know a little about elephants, but that doesn’t make me a vet either). But if I was a doctor I would write every stressed and overworked sales professional a prescription. That prescription would simply read, ‘Take one CRM and come see me in six months time’. CRM software is designed to simplify the whole selling process – just what every stressed sales professional needs. Modern, and insightful sales CRM software, like Teamgate, is equipped with a massive range of tools and features designed to actively help every sales person to handle their daily tasks, and achieve their goals in a more time-effective, and in a more results-oriented way. You get the results, stress stays away. Think of Teamgate as a stress-buster. Handling the tasks that eat away at your time, reminding you of calls and meetings and freeing your mind to concentrate on more important matters. Teamgate helps you to prioritise, organise, and understand the whole sales environment around you, making it easier for you to get on with the real deal – selling. Once you immerse yourself in the easy-to-learn software (no stress there – in fact, Teamgate has been voted the most user-friendly CRM on the market) you’ll instantly reap the rewards. Countless tasks, that once ate into your time – and your soul – are now completed in an instant, if not automatically. 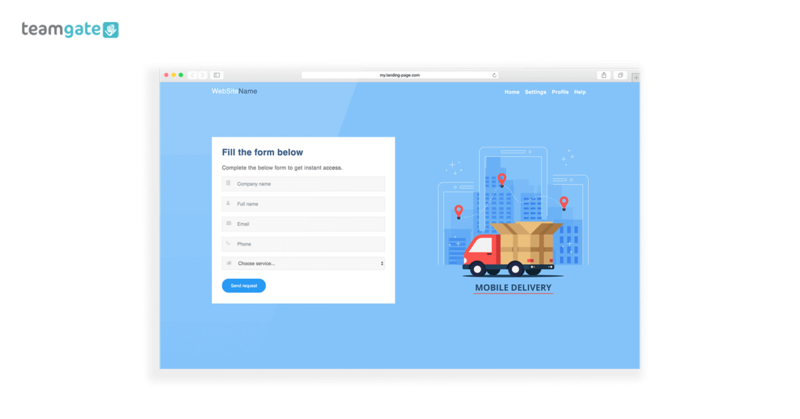 In fact, Teamgate and its many futuristic integrations can pretty much automate almost every stage of the sales pipeline – except perhaps talk to your customers for you. 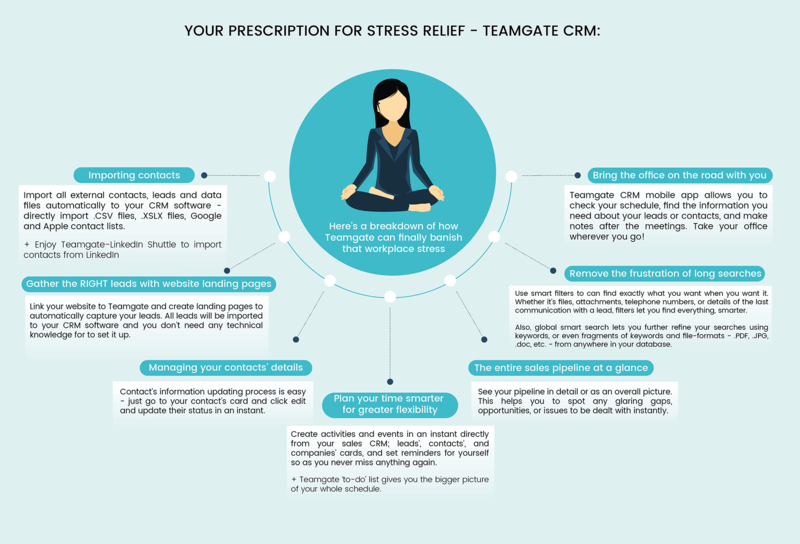 Here’s a breakdown of how Teamgate can finally banish that workplace stress, and give you back the life you need, and deserve. Manually importing mile-long lists of contacts can make you lose your will to live. Import all external contacts, leads and data files automatically to your CRM software. With Teamgate you can directly import .CSV files, .XSLX files, Google and Apple contact lists. And here’s a real winner, with the autonomous Teamgate shuttle extension you can import targeted contact details directly from the world’s number one business networking site, LinkedIn. “Great, but I don’t want duplicates. Duplicates ruin my day”. Don’t worry, Teamgate will ensure that you’ll have no duplicates. Now go spend some time with your family. Spending time on the phone to leads that have no hope of going anywhere would raise anyone’s blood pressure. But, how about this. By linking your website to Teamgate you can create landing pages that capture exactly the leads you’re after. You don’t need any technical knowledge (no stress there either), and the landing pages automatically capture your site visitors’ data and import them to your CRM software. Did you save enough time for a long-weekend away yet? You just come off the phone with a lead and discover that they’ve changed all their contact info. Great, now you have to sit in the office updating all this new information. With Teamgate there’s no complicated updating process. Just go to your contact’s card and click edit and update their status in an instant. Here’s the super part. When you update a contact’s details in your CRM, the contact’s details are also – conveniently saving you a lot of time – updated wherever they might occur in the system; whether that’s in the leads, deals, and/or companies section. This great function ensures that your contact details are kept clean, neat, and up-to-date at all times. Plan all of your activities and events, share information with your leads and contacts and stay up to date with your complete sales environment. 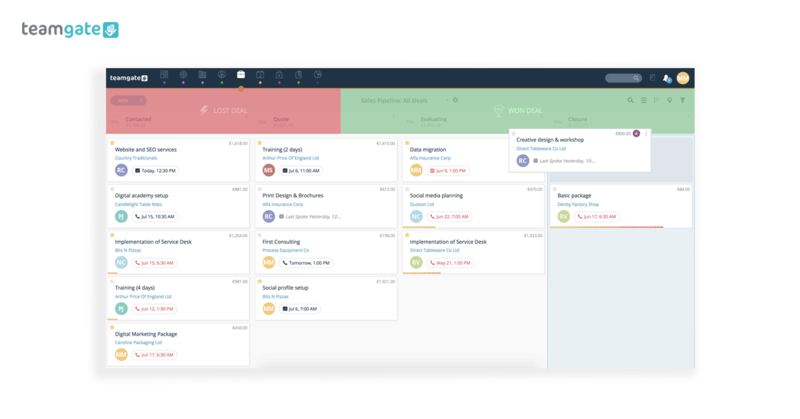 You can create activities and events in an instant directly from your sales CRM; leads’, contacts’, and companies’ cards, and set reminders for yourself so as you never miss anything again. Plus, your Teamgate ‘to-do’ list gives you the bigger picture of your whole schedule. 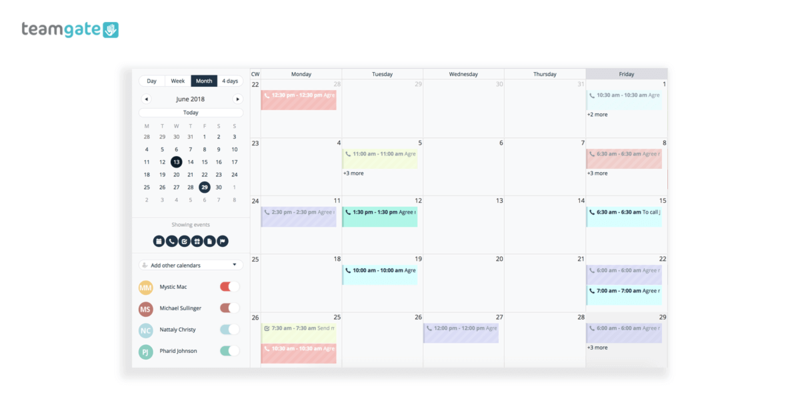 With a simple and uncluttered view, your Teamgate calendar gives you an overview of tasks due today, for the entire week, and for tasks that may have somehow slipped past. Having the ability to take a holistic view of your entire sales pipeline can be a really great way to avoid stress in sales. Teamgate lets you see your pipeline in detail or as an overall picture. This helps you to spot any glaring gaps, opportunities, or issues to be dealt with instantly. You don’t have to wake up in the middle of the night wondering if you’ve missed something, it’s all there in your sales CRM software, clearly laid out, and so easy to interpret. Sweet dreams! Everyone knows that searching through mounds of information can drive you around the bend. And, it can get in the way of doing the really important stuff. Teamgate filters and saved searches cuts through all that time-wasting effort. Using smart filters you can find exactly what you want when you want it. Whether it’s files, attachments, telephone numbers, or details of the last communication with a lead, filters let you find everything, smarter. You even get the choice of saving filters you use regularly, so can you find what you want far quicker than ever before. And another thing, Teamgate global smart search lets you further refine your searches using keywords, or even fragments of keywords and file-formats – .PDF, .JPG, .Doc, etc. – from anywhere in your database. Even when you’re far from the office, your Teamgate CRM software is fully mobile and lets you take your office wherever you go. No more telling a client that you’ll share a document, or check your diary for an available meeting slot once you get back to the office. There’s no need, as long as you have your office in your pocket wherever you go. Unlike when a doctor prescribes a pill and tells you to come back in six months time, with Teamgate you don’t need to come back in six months. You’ll see the improvement in your sales process, your results, and your health in no time. Stress for salespeople is a very real and ever-present danger, but not one that’s irreversible, you’ll be glad to hear. Along with a sensible diet, keeping a healthy mind, exercising regularly, and promoting a more positive and balanced outlook, Teamgate sales CRM gives you the time and the freedom to promote this change. Sales stress should no longer be seen as a side-effect of sales, at least not when you have Teamgate on your side. Sign up today for a free trial, and start your journey from here. Brendan is a writer and content creator at Teamgate specialising in general interest stories across all areas of the sales and marketing processes. A fully personalised live demo to see how Teamgate CRM works. Ask anything and get all the answers in real-time.